I'm more of a heels kinda girl. I love wearing high heels. I feel in charge (and taller of course!). But this week I'm dying. Legit just dying. I've been hitting the gym hard and my legs felt like jelly and I just couldn't deal. Hence, the sneakers. But don't get me wrong. I love these sneakers so much I've been wearing them like crazy! In January, I was at my heaviest weight wise. I was at 137 lbs and felt like a slob and was beyond nervous that I wasn't going to fit in my dress. Since then, I've been hitting the gym (somewhat hard) - mostly cardio up until now. Why? Because I wanted to be at an ideal weight before I started weight training. Since January, I've dropped down to 119 lbs and my ideal weight was 115 lbs. But I've started to look a little too thin on top. So I've started my weight training and I've been hurting like a mother fucker ....... my abs, arms, legs, everything hurts. I can barely walk, I can't laugh, and it's just no fun AT ALL. But I know it'll all be worth it when we head to DR in May!!! Can someone please send me something to soothe my muscles, please! Your hard work and exercise obviously pays off - you look fabulous! 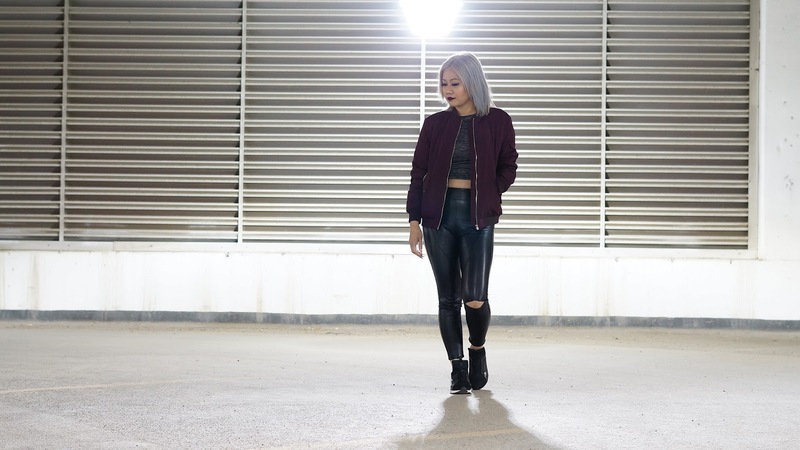 I love the outfit - the crop-top, bomber jacket, leggings and sneakers all look great worn by you. Be healthy and have a wonderful Spring!